 Zoho Checkout is designed with you in mind. Build a custom, branded payment page in a matter of minutes and start accepting payments right away. Get paid via personalized payment pages in three simple steps. Build a secure payment page without writing a single line of code. We handle the coding and hosting so you don't have to. Enter the collection amount, or let your customers decide. Choose from our ready-to-use professional templates. Choose between one-time or recurring payments. Configure intervals, dates, and duration for recurring payments. Make your payment page your own. Fine-tune the look and feel of the page to offer your customers a seamless brand experience. Custom tailor labels and fields based on your industry. Preview the changes, and make your page live. Design down to the finest detail with custom fonts, colors, and background images. Embed your company logo to build brand awareness. Whether it's a one-time or a recurring transaction, take the hassle out of collecting payments. Connect with a payment gateway and start accepting easy online payments. Resolve failed recurring transactions by automatically retrying declined cards. Share your payment page on your website, in an email, or on your social media accounts. Seamlessly process credit card payments from Visa, MasterCard and Amex. Our payment pages are just as responsive on mobile devices, allowing customers to make payments on the go. Provide a secure way to pay. With Zoho Checkout, we take care of your key security needs via SSL encryption, and ensure your customers' credit card information is fully protected. Run real-time analytics on successful payments, and find out how much money you've made. Follow up with lost opportunities, and recover revenue that might have otherwise slipped through the cracks. "Zoho Checkout has been an important part in delivering the convenience of online recurring payments for our customers. We love the interface, the controls, and the excellent customer service from the Zoho team"
Make online donations a breeze. Allow donors to choose the contribution amount and frequency at checkout. Running a training center? Accept one-time and recurring fees online from your students. Start accepting one-time and recurring online payments today!